Order your Brazilian Rosewood 151 Slot Pen Trunk today from FahrneysPens.com. Fine Pens, Refills & Luxurious Gifts – great prices & fast shipping. 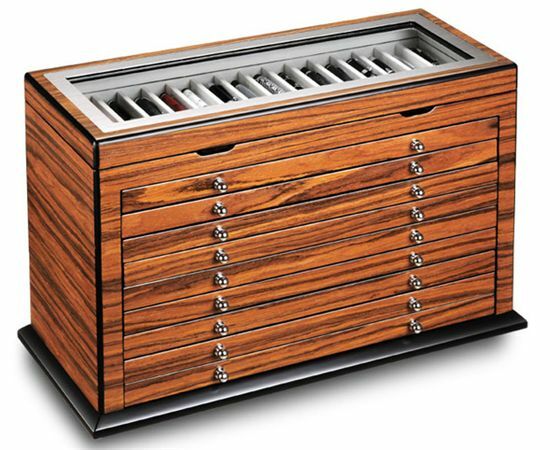 Protect your precious pens in this Brazilian Rosewood Pen Trunk at an extraordinary price! This stunning case is a must-have for collectors with slots for 151 pens! The top compartment holds 16 pens with a clear top. 9 lower trays hold 15 pens each. Pen compartments are 1” wide and 6.5” deep, providing ample space for every pen, even oversize, limited edition models, and are lined with a non-tarnishing cloth. Size of the overall trunk is 19.5” long, 12” high and 8.5” deep. Due to size/weight, additional charges will apply on air shipments.